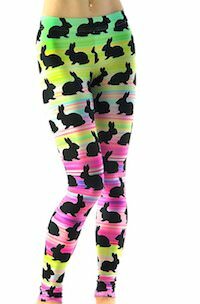 If you want fun leggings to wear on Easter then you just have to check out these pink Easter leggings. The pink leggings are covered in funky Easter bunnies wearing cool glasses and outfits and there are lots of decorated Easter eggs on it too. And these fun holiday leggings come in women’s sizes XSmall – 5XL and are made from 90% polyester and 10% spandex. So wearing leggings like this then you are just ready for the perfect Easter egg hunt and breakfast. Get your Pink Easter Leggings for $13.99 and Free Shipping.